Paulus Potter was born on November 25th, 1625 in the Dutch town of Enkhuizen. He learned to paint from his father and became an apprentice of Jacob de Wet in Haarlem at the age of 17. Just four years later he was admitted to the Sain Lucas Guild in Delft as a master painter. He died of tuberculosis at the age of 29 leaving hundreds of works, most of them in a small format. He started out painting historic pieces but became famous for his paintings of domestic animals (we have seen his painting The Bull in a previous post). 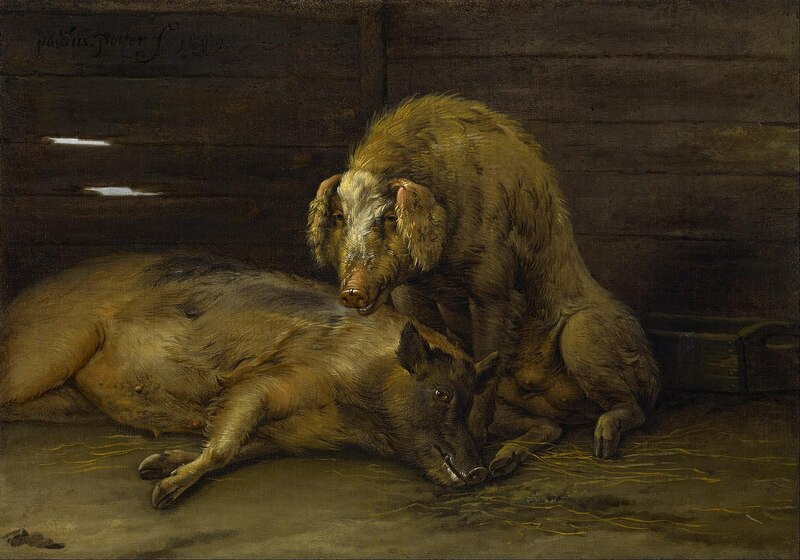 Two Pigs in a Sty measures 12 3/4 × 17 3/4 inch (32.4 × 45.1 cm) and lives up to his title. The question is why someone wants to paint pigs in the first place. In general, the early masters didn’t paint animals as the primary subject of a painting unless they were part of a hunting scene, let alone domestic ones (and it is hard to imagine it hanging on the wall of some 17th-century court). Yet Potter painted it with love and care. This particular variety of pigs is now extinct. Both pigs are hairy, the sitting one having hanging ears (Dutch: “Loboren”) and the one lying down has standing ears (Dutch: “prikoren”). Both look a lot like today’s wild boars. Notice the hanging ears and the curly hairs. 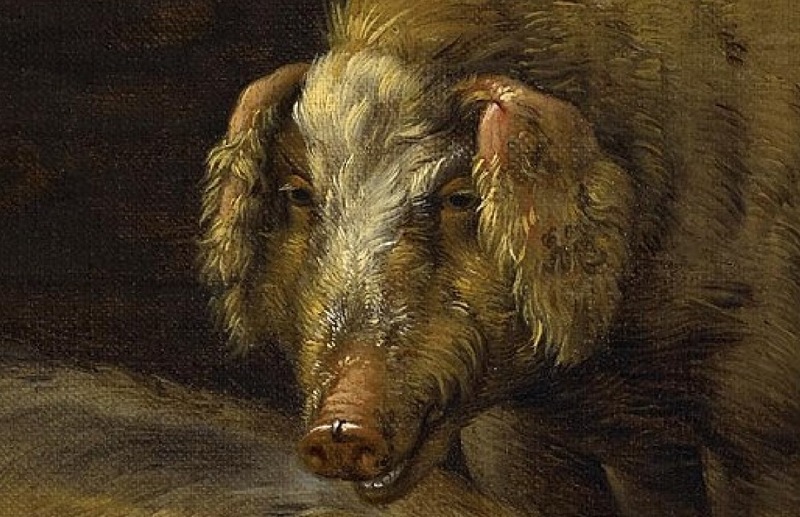 This variety of pig is visible on a number of 17th-century paintings but is extinct since around 1953.